Dually cursed and blessed with a life of perpetual maturity due to an early exposure to folk music, British poetess and musician Laura Marling has entirely transcended her 26 years. This was especially evident this night, as the songstress took to the stage dressed "like a school teacher," donning head-to-toe beige and white fabrics, a scarf and suede boots. Marling opened the evening with "Take the Night Off" from her Once I Was An Eagle album, a highly Dylan-esque ten-minute track that explores a relationship gone and the regret felt over the loss of the heightened sense of love. This strong and powerful choice reads like an epic story, a string of mental processes that focus on interchanging self-assuredness and insecurity. Marling was extremely stoic and strictly focused on the music, icy but willing to show the vulnerability of her lyrics as she effortlessly strummed through eight different guitar tunings. But every so often, the highly vocal and adoring audience would get a coy accented remark or a smile, prompting one fan to yell out, "Every time you smile I feel like I just won a prize!" After performing "Strange" and "Devil's Spoke," Marling treated the audience to three previews from her impending new album, sweetly asking concertgoers to not put one of them on the internet. However, it can be said that one new track was particularly lovely, with its focus on reminiscing to wilder and freer days. Marling very much focuses on the emotional journey of the heartbroken; with "I Feel Your Love" from Short Movie, the audience felt the desperation of her powerful phrases by Marling's building and falling vocals and chord progressions. The electric "Night After Night" showcased Marling's preference for eloquent vocal explorations. With five albums under her belt of thick lyric-heavy tracks to the beat of her rich, strumming guitar, it is a wonder that Marling is never want for a good line: she is absolutely full of them. Singing "Alas I Cannot Swim" — a beloved fan favourite she wrote when she was 17 — it is clear that while the early hit is a great piece of music, her contemporary tracks are far richer in construction. In honour of Dolly Parton being on the last episode of her podcast Reversal of the Muse — a series of interviews between Marling and women in the music industry — the singer-songwriter covered fellow acclaimed musician's "Do I Ever Cross Your Mind," a fitting cover since Parton was only just in Vancouver last week for her Pure and Simple tour. 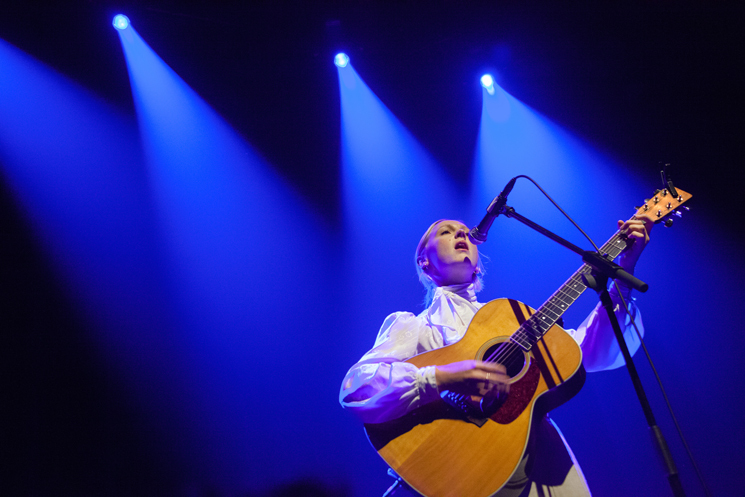 Closing with "Once" and "Sophia," Marling left concertgoers without an encore, but still a satisfying serving of her particularly muscular songs. The songstress speaks through songs rather than monologues, and she can better express herself through the poetics of her experiences and fictions. This definitely contributes to her eclectic cold mystique.